My wife has been doing this for years. It is easier than it looks. My wife and I may discuss what we want to eat a couple days before she goes shopping. 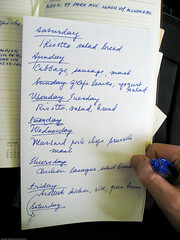 Weekly menu planning makes the whole process more organized and easier for my wife. The financial rewards is just an extra. My hubby and I have been doing this for 2 years and we will never go back to our old ways. Not only are we healthier but we also spend less money. Sure it takes a bit of work but it is well worth it in the end. Having ready to go healthy lunches and dinners make managing the week a lot easier. We also have a freezer inventory which is a great compliment to this.